Prototype: French State Railways (SNCF) class 230 F passenger locomotive. Former German P 8. The boiler has 2 domes, no smoke deflectors. Three-axle box-style tender. 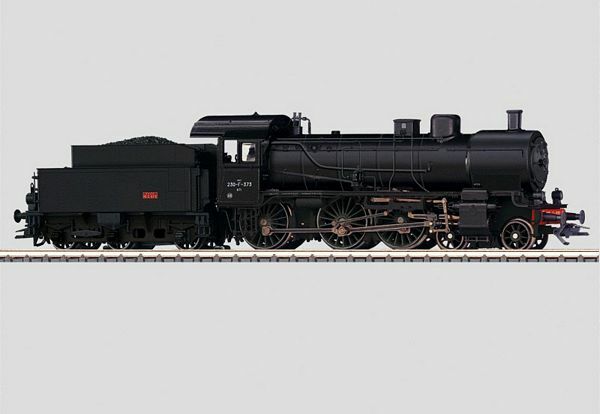 Model: The locomotive comes with a digital decoder and controlled high-efficiency propulsion. It has a powerful can motor with a bell-shaped armature, mounted in the boiler. 3 axles powered. 2 traction tires. The locomotive is ready for installation of a 72270 smoke generator. The headlights are maintenance-free LED's. The headlights and smoke generator contact will work in conventional operation, and can be controlled digitally. The acceleration and braking delay can be controlled digitally with a 6021 Control Unit or Marklin Systems. There is a close coupling between the locomotive and tender. The engineer's cab has interior details. The brake hoses, prototype couplers, and the piston rod protective tubes can be mounted separately. Length over the buffers 21.0 cm / 8-1/4.